Perhaps you think I am crazy to have said that spring is here in light of the record snowfalls. Still, it is not the snow nor the cold that defines winter, or any other season, it is the amount of light and dark in the days. And the light is stronger and longer! Just look at the leaves these roots are putting out. 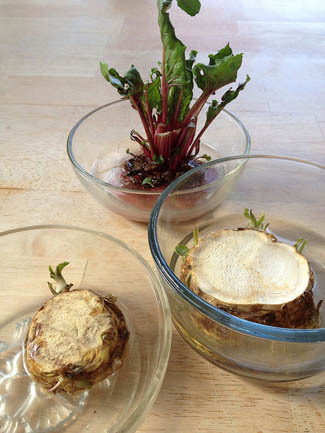 A beet top and two pieces of horseradish can't be wrong. It is indeed spring. Next week I'll share important information about the value of snow, "the poor person's fertilizer." But for now, let's look at breakfast. Breakfast is the most important meal of the day. Study after study has finds eating breakfast makes your day better, and it makes your whole life better. But it is not part of most of our lifestyles. Eating a big breakfast is easier for a goat herder than for an office worker, granted. Many people push themselves to wake up at hours that are not metabolically healthy for them. Eating a large meal when you don't want to be awake can be difficult. So many people eat something in the morning, because breakfast is important, right? And that something is usually refined carbohydrates – like bagels, donuts, sweetened cereals – washed down with coffee. I actually think it may be better not to eat at all in the morning than to eat like that. But if you can't – for one reason or another – eat a hearty breakfast, here's the good news: A glass of nourishing herbal infusion counts as a good breakfast. A glass of nourishing herbal infusion – such as nettle, oatstraw, red clover, or comfrey leaf – provides more protein, vitamins, and minerals than most breakfast cereals. Oatmeal is certainly the exception to granolas and other ready-to-eat breakfast cereals. And, with a little bit of attention, but not much time, it can be turned into a magnificently nourishing accompaniment to your glass (or cup) of nourishing herbal infusion in the morning. 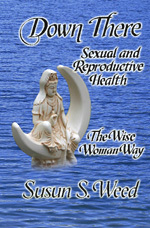 I published the recipe for enhanced oatmeal in my green book Healing Wise (under the name Wild n' Oats) over twenty years ago. It is still a cold weather mainstay for breakfast at Laughing Rock Farm decades later, so it has indeed stood the test of time. p.s. If you missed the great teleseminar on Healthy Hearts with Robin Rose Bennett (one of my first apprentices), you can still listen to the recording here. If you are pressed for time, gather and measure your ingredients the night before. 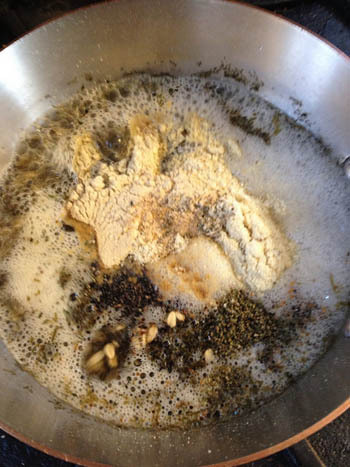 You will need water, oats, seaweed, wild seeds, sea salt, and potent powders. Everything except the oats and the seaweed is optional, so use what you have. 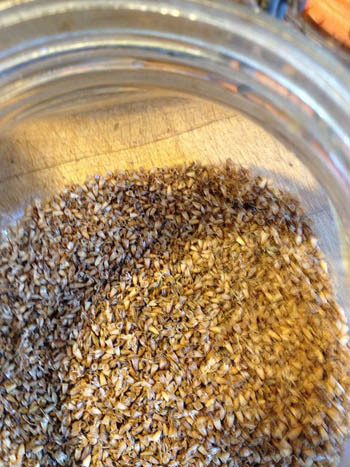 Now's the time to commit to harvesting some wild seeds this summer for your Wild n' Oats next winter. 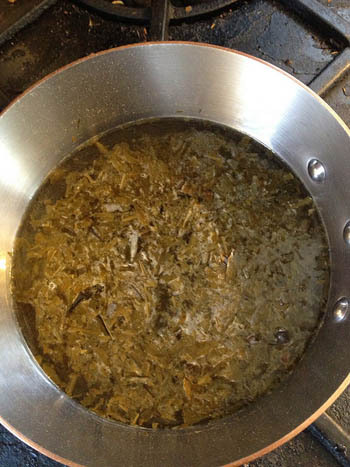 My favorite seaweed for this breakfast is Nereocystis kelp, also known as bladderwhip kelp. I get mine from Ryan Drum, who confirmed for me recently that it is perfectly safe, better, perfectly health-promoting, to eat west coast seaweeds despite the nuclear accident in Japan. 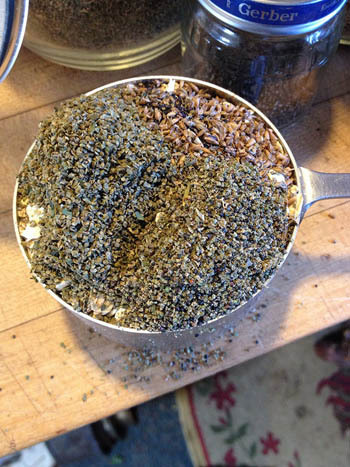 It is great fun to have an assortment of wild seeds to choose from. 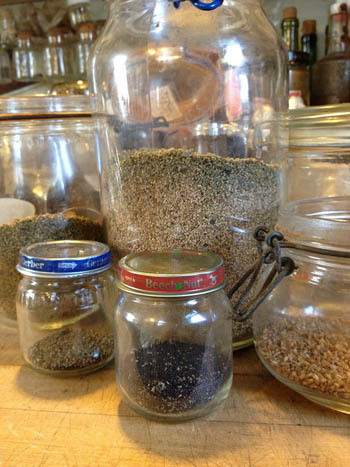 Here are my jars of lamb's quarter seeds, nettle seeds, amaranth seeds, plantain seeds. And here is a close-up of plantain seed, known to reduce cholesterol, improve gut flora, and keep you regular. This one is nettle seed. A boon ally to the prostate. If he eats it in his oatmeal, so much the better, don't you agree? Wink. 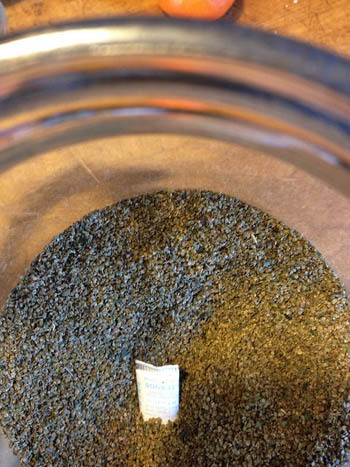 And here is lamb's quarter seed, or wild quinoa, a highly alkalinizing grain which is super easy to harvest in quantity from nearly any garden or farm. 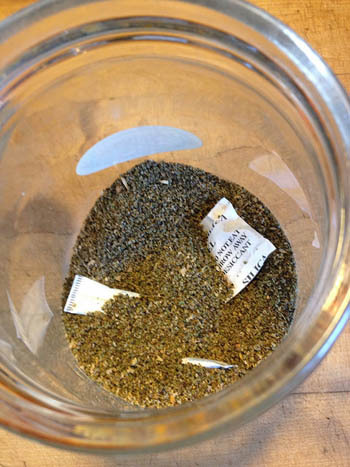 Choose from any non-processed powdered herbs or foods. 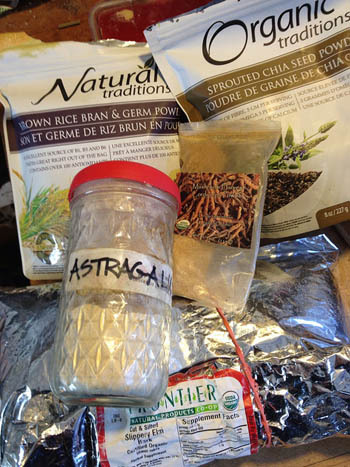 Here is astragalus powder, slippery elm powder, powered medicinal mushrooms, and some new products I was sent to try, powdered chia seed and powdered brown rice bran and germ. Don't forget to add some sea salt. Without it the oatmeal will taste bland. I find a heaping ¼ teaspoonful is just right. Cook, covered, stirring now and then, until all the water is absorbed, which usually takes 15-20 minutes. 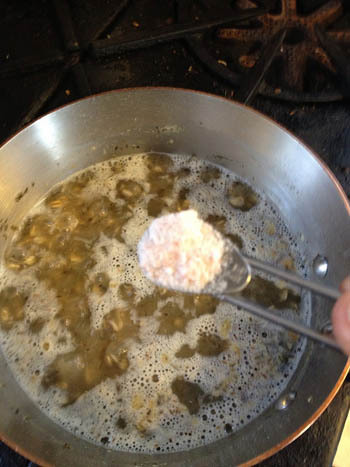 Be careful it does not boil over, as it will make a sticky, gummy mess. Express route instructions: Turn on the fire under the saucepan which already contains three cups of water and a handful of crushed seaweed and go brush your hair and/or your teeth. 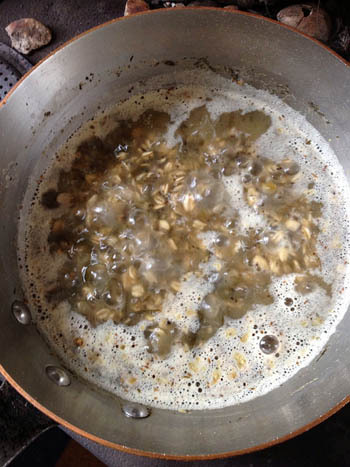 When you are done, and the water has come to a boil, add the measured oats and seeds. Stir. Add the measured potent powders. Stir. Lower fire. Put a lid on the pot loosely, and get ready for work, stirring your oats once or twice as you pass by. When you are ready, it is too. Eat. Enjoy! Green blessings are everywhere, even under the snow. 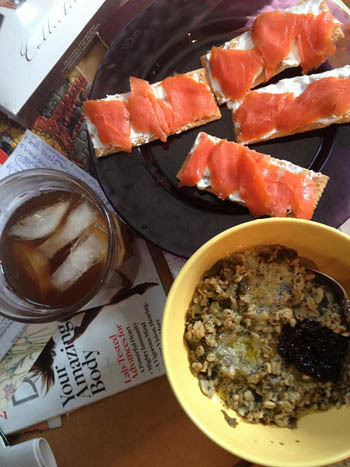 Here is my complete breakfast: A large glass of iced infusion (yes, even in the winter, I prefer my infusion iced), a big bowl of Wild n' Oats garnished with a tablespoon of butter and a teaspoon of elderberry jam, and four whole wheat crackers spread with homemade fermented cheese and smoked salmon. Yum!